Dr. John Gottman believes that couples familiar with one another’s lives have happier and more stable relationships. This familiarity can prove helpful when a couple encounters a stressful event, life transition or conflict. One way to stay familiar with your partner’s life is to stay up-to-date on their preferences, habits and dreams. While you may feel you already know the simple things that make your partner tick, our preferences, habits and dreams can often, as time passes, change. It’s so natural to fall into assuming you know what your partner is experiencing or thinking and double-checking those assumptions can be a helpful way to build the connection in your relationship. With your partner, come up with a list of things you think you know or want to know about your partner (e.g., Favorite family member, saddest memory, go-to drink or cocktail). Include things you think you already know about each other and also push yourself to come up with some questions that may be difficult to answer. Once you have a list of 20-30 items, turn to each other, pick a question, say it aloud and state what you believe your partner would answer. Then check-in with them, “Did I get it right?” Remember, this is not a game with a winner or loser; this is just a fun way to keep-up-to date with your partner. We are all drawn to reassure. When someone tells us something that’s hard to hear or that suggests that they’re in pain or upset, it’s natural for us to jump to wanting to fix the issue or to convey that our belief is that everything is (or will be) okay. It feels alienating, disconnecting and, sometimes, it can bring up feelings of rejection and shame. The next time someone you love tells you they are hurting, notice your response. Are you drawn to reassure them? Do you feel the impulse to tell them that their experience is not your experience? Just try to observe your response – without judgement – and, if you can, take a moment to let your loved one know that you hear them. Having conflict that cannot be fixed does not mean that your relationship is set up to fail. Every single couple is faced with differences that are completely unresolvable. Your job is to figure out if you want to cope with these problems. Your job is to figure out if your needs and wants can be met in a relationship with these particular unresolvable problems. Your job is to acknowledge these unresolvable problems with your partner and then develop strategies to cope with conflict when it appears. Despite this, most of us have at least one or two that we perform day in and day out. Sleeping on a certain side of the bed, drinking the first morning coffee, visiting certain websites when we turn on the computer. These habitual activities often bring a familiarity, comfort and calm to the day. Rituals are predictable routines that have meaning. Many people have rituals that have come from family tradition, religion, or happy happenstance. When couples come together, these rituals become part of the partnership. As time moves on, couples usually develop some rituals of their own. When I work with a couple, I pay close attention to the rituals that seem to be working well – routines that seem easy, inviting and joyful for both partners. Many times, these events have occurred without fanfare and with no knowledge of their growing symbolic meaning. It takes some time thinking through these routines to realize that they’ve quietly become important relationship rituals. Tip to Thrive: Consciously introduce rituals that feel good into your relationship. This may mean looking at the rituals you already share and making deliberate efforts to continue them or it may mean discussing some new rituals to establish. With your partner, discuss specific behaviors that you already include when you leave each other’s company. Do you see any routines that feel good for both of you? If yes, think about continuing them with an eye towards what meaning these behaviors hold in your relationship. Here is a ritual that I’ve seen work well for couples. Try it out and see how it feels. If it doesn’t feel right, try exploring other types of rituals. Remember that it’s important that your and your partner find rituals that make sense for you and your relationship. Step 2: Remember what your partner says for their one thing. Write it down if it helps you remember. Step 3: When you return to each other, ask about the one thing mentioned when parting. Encourage elaborate answers by asking questions that start with How or What. Step 4: Continue doing this for a few weeks and let me know how it turns out! Relationship rituals help create shared meaning between two partners and present opportunities for connection. When methods of checking in with each other, or noting an event or milestone, are predictable and consistent, partners may experience less relationship anxiety. In couples that are disconnected, planned rituals offer deliberate and focused ways on reconnecting. As always, feel free to email me with any questions about this exercise. I believe that when we were young, we were all told, explicitly and implicitly, what was important. We gained information about highly valued characteristics from our peers, the media and our parents. As a therapist, I listen carefully to the values my clients have gained from their families as a way of developing a deeper understanding of their identity. With couples, I find that discussions around the differences in family values often provide insight into the places where each couple feels most stuck. Have you ever taken a look at the characteristics highly valued by your family? Below is an exercise that may help you start this process. It’s pretty quick and easy. You can do it alone or with your partner. While reading through this list, note the characteristics that you remember as highly valued by your family when you were a child. Which of these qualities were disregarded, almost as if they didn’t exist? Which of these qualities were mocked or belittled? What can you see about this? How do you now, as an adult, value the qualities above? How has what your family valued influenced the way you currently live your life? Visit Me In The Heart Of Hayes Valley. 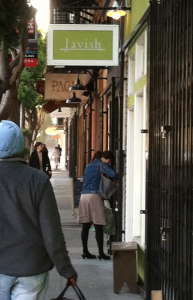 Hayes Valley is a quaint and fashionable neighborhood with easy access to public transportation and area highways. Meet up at the local cafe or ice cream stand to reconnect with one another before session. Sample one of the excellent nearby restaurants or unique bars to debrief once your session has ended. Click here to go to my online scheduling system. Will counseling help our relationship? Counseling can improve your ability to be authentic. My goal is to help you connect in a way that allows you to really feel the care that you have for one another while safely discussing your needs, desires, fears or anger. When couples feel more connected they usually feel better about engaging in some of the hardest relationship decisions. How do I know if you are the right therapist for us? It is really important to find a therapist that feels like a good fit. Just because a therapist was helpful for your friends it does not mean that they are the best therapist for you. I encourage potential clients to interview multiple therapists to assess what style feels best. Please call and schedule a phone consultation so that we may explore if my style is a good fit for you. I will be spending our first phone call and our first few sessions also assessing our fit. It is possible that I may decide that another therapist may be more skilled in working with your particular struggle. In this case, I will speak with you about my thoughts and provide outside referrals. How often do you see clients? Can we schedule sessions 2 or 3 weeks apart? I strongly recommend starting with weekly sessions for a multitude of reasons that I can discuss more with you during a consultation. Mostly, I believe that weekly sessions are more effective in getting to the core of what is really going on between the two of you. Consistent sessions help to foster a sense of trust and understanding. Indeed, there are always exceptions and I welcome your call if you would like to speak more about the possibility of extended time between sessions. I do not take insurance and I do not work directly with insurance companies. Some insurance companies may provide you reimbursement for couples counseling services. I can provide you a statement with your diagnosis and service code if you need one for reimbursement. Please contact your health insurance company for more information. What type of therapy do you practice? Is there some place I can read more about what you do? I work with couples utilizing Emotionally Focused Couples Therapy (EFT or EFCT). You can read more about EFT and its research proven effectiveness by clicking here. My style is warm, down-to-earth, and collaborative. I bring a sense of humor and a straightforward approach to working with couples. I am currently training in Accelerated Experiential Dynamic Psychotherapy (AEDP), which you can learn more about by clicking here. Also, at times in session, I will use tools and ideas from my training in Gottman Method Couples Therapy. You can read more about the research-based principles of Gottman Method Couples Therapy by clicking here. Okay, I think I’m ready to call you to explore if you are the right therapist for me. What do I do next? Please feel free to call my office at 415-902-2039 or send me an email at therapy@karensmillie.com. You can also schedule a consultation using my online schedule. When we speak, I will ask you to tell me a little bit about your relationship. You will also have some time to ask me any questions that you have about the process of couples counseling. I love my job. Helping partners connect is an amazing and nourishing way to spend my day. I’ve also seen the extraordinary way that couples counseling provides experiences that force couples to look at their identities and core needs as individuals. I’m trained in highly effective, research-based counseling methods that have been shown to help couples. I draw my understanding of couple dynamics from Emotionally Focused Couples Therapy and utilize tools and ideas from Gottman Method Couples Therapy. My practice is influenced by my experience as an individual psychotherapist and group therapist. For years, I’ve worked with individuals struggling with depression & anxiety, grief & loss, intimacy & sexual concerns, childhood abuse, substance use, chronic illness, caregiver burnout, and aging-related challenges. I have a master of science degree in Marriage, Family & Child Counseling and I am licensed in the state of California as a Marriage & Family Therapist (MFT). My license number is: MFC50948. When you think of saying: When you leave the dishes in the sink it drives me crazy! Try saying: When I see dishes in the sink I feel overwhelmed. When you think of saying: I’m pissed that you didn’t call when you said you would. Try saying: When plans that we make to communicate don’t happen, I feel hurt and annoyed. When you think of saying: I hate when you say things like that. Try saying: Words like that make me feel uncomfortable and attacked. The same goes for expressing needs. Sure, it is completely valid to say to your partner, “I need you to do …,” or “I need … from you.” However, if you are feeling distant from your partner you may want to try framing your needs in a way that stays completely focused on you. When you think of saying: I need you to stop being such a slob. Try saying: I need there to be days where the kitchen sink is completely clean. When you think of saying: I need you to call me when you say you will. Try saying: I need my calls to be returned. When you think of saying: I need you to stop insulting me. Try saying: I need to feel safe in this relationship. Try it next time you want to express your feelings or needs to your partner and see how it works. But they’re there – even when we want to ignore them. How do you feel about your relationship right now? 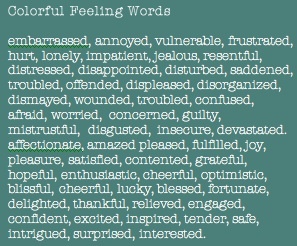 If your first response is fine, okay, or good/bad, try digging for a feeling word that has more color to it. What needs do you have that are satisfied in this relationship? What needs do you believe are not being met? How do you feel about that? Growing up, how did people in your family and community communicate their needs? What was that like for you? Try not to judge your answers to these questions. Just notice your thoughts and feelings.